My team is tasked with expanding Forrester’s enterprise and mid-market client base in the U.S. We are focused on identifying prospective clients, understanding their business challenges and opportunities, and aligning Forrester as a partner to help them grow. Forrester Research, Inc. is a leading global independent research, data, and advisory services firm. Our unique insights are grounded in annual surveys of more than 675,000 consumers and business leaders worldwide, rigorous and objective research methodologies, and the shared wisdom of our clients. How has the JWMI Curriculum helped your career? The JWMI curriculum has been vital to my development as a manager and leader. After learning the ‘Welch Way,’ I was immediately able to focus on the things that matter: mission and values, voice and dignity, candor, and differentiation. The lessons I learned have become a leadership compass for me. WHY WERE YOU LOOKING TO GET AN MBA? When I became a manager, I knew the responsibility I had accepted was significant. It was no longer about me—it was all about the success of my team. This responsibility pushed me to look for online/Executive MBA programs that could enhance my leadership skills and make me more effective as a manager and leader. Absolutely. The most powerful aspect of the JWMI program is how immediately applicable the lessons are. Every class I’ve taken has provided me with a new idea, technique, or solution that I’ve been able to apply at work. One example of this is around the concept of candor. Jack Welch suggested that we seek upward feedback and specifically ask, “what can I do as your manager to make you 20% more effective in your role?”. The answers to this question completely changed how we worked together as a team. We were able to generate ideas that we apply as part of our regular process now. Looking back at what you thought about an online program when you first embarked, what was your overall impression now? Did it meet your expectations, via DQ Boards, EOP videos, Jack calls, Faculty, etc. The program has exceeded my expectations. I didn’t realize how actionable the courses would be and the impact it would have on my daily process and approach. From financial management to operations management, to leadership and people management, JWMI has been like a ‘leadership personal trainer’ for me—focused on results. WHAT’S BEEN YOUR MOST REWARDING EXPERIENCE IN THE PROGRAM? 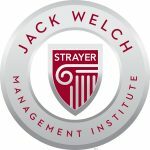 The interactions I have had with Jack Welch have been incredibly rewarding. As busy as Jack is, he takes the time to interact with students. I consider Jack to be one of the great business leaders of the modern era and the lessons I’ve learned from him, and JWMI faculty are invaluable. As I’ve learned through the JWMI program, work/life balance is really a work/life choice. I chose to dedicate time and energy to be better—a better leader for my team, a better employee for my company, and to help provide a better life for my family. 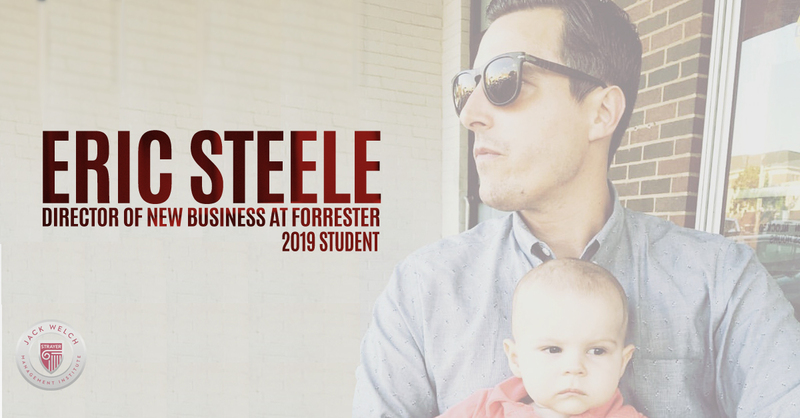 It is one of the best decisions I’ve made, and it wouldn’t be possible without the love and support of my family and the amazing culture of enablement and development at Forrester. I learned quickly that time management is the key to balancing work and education. By pushing myself to implement lessons at work, I was able to combine work and MBA course work in an actionable way (which helped with the workload). PLEASE SHARE ANY ADVICE FOR NEW STUDENTS EMBARKING ON THE MBA JOURNEY. The best advice I can give new students is to push yourself to implement everything you learn in your workplace. There is no better way to learn than to do! IN JUST A FEW WORDS, DESCRIBE WHAT “LEADERSHIP” MEANS TO YOU. Leadership is all about putting the team first—making the team more successful, removing hurdles from the team, providing the team with a voice and dignity, and ensuring that the team reaches their biggest, boldest goals. Good leaders explain what’s in it for the team when they win, and relentlessly upgrade the team in the pursuit of a clear mission.